Not often come accross Berberis chenaultii makes an extremely dense foliaged small shrub with slight arching growth habit. Small mid green spiny leaves. A deservedly popular early-flowering shrub with small dark green leaves and clusters of bright orange-red flowers bourne in spring. As the name suggests a smaller more compact form of the popular evergreen shrub Berberis Darwinii with the same bright orange flowers in the Spring. 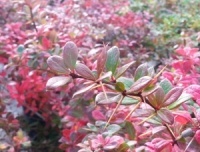 A really choice berberis for someone looking for that something a little different. Berberis dictophylla makes a good sized shrub upto about 2 metres. Attractive red young growth with a white bloom and fascinating white undersides to the mid green leaves. Raised in Holland around 1960, makes a compact small evergreen shrub with glossy green spiny leaves white beneath often giving good autumnal tones, masses of yellow flowers in the spring. A small evergreen shrub with arching branches making a neat mound of foliage. Young leaves are a reddish bronze which contrast superbly with the older dark green spiny leaves. 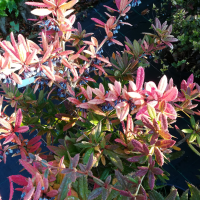 A lovely small shrub renouned for its rich autumn foliage display of orange and purple. 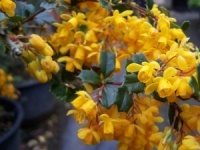 Produces small clusters of typical berberis type yellow flowers.